Crime is big news. From murder to theft to drug gangs, crime and criminal justice affect the lives of millions of people worldwide. Hardly surprisingly, crime has been pushed high up the public policy agenda across the world. But how can we measure crime, or evaluate the effectiveness of preventative measures? Does the threat of prison reduce someone's likelihood of reoffending, or would rehabilitation be more constructive?In this Very Short Introduction Tim Newburn considers how we can study trends in crime, and use them to inform preventative policy and criminal justice. Analysing the history of the subject, he reflects on our understanding of crime and responses to crime in earlier historical periods. 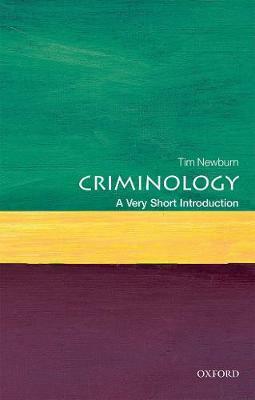 Considering trends in crime in the developed world, Newburn discusses its causes, exploring the relationship between drugs and crime, analysing what we know about why people stop offending, and looking at both formal and informal responses to crime. Newburn concludes by discussing what role criminology can plausibly be anticipated to have in crime control and politics, and what its limits are. ABOUT THE SERIES: The Very Short Introductions series from Oxford University Press contains hundreds of titles in almost every subject area. These pocket-sized books are the perfect way to get ahead in a new subject quickly. Our expert authors combine facts, analysis, perspective, new ideas, and enthusiasm to make interesting and challenging topics highly readable.